To end the twenty-seventh season of the Scholastic Games radio quiz, a weekly feature of WEOL radio (AM 930), the academic team from Olmsted Falls won its fifth academic championship. A strong team from Oberlin’s Firelands High School held the unstoppable Falls team to its lowest winning score of the year, a final tally of 350 to 230. The team from Olmsted Falls consisted of Jake Dahlinger, Ben Meredyk, and team captain Joey Calabrase, who was honored with his third “Standout Scholar Award,” a $50 prize given to the student judged to have contributed the most to his or her team each week. He has won the award more than any other student this academic year, though his teammate Meredyk received it following the team’s semifinal appearance. The Firelands team actually consisted of three past Standout winners, an all-time record for the broadcast. Its members were Michael Durdak, team captain Ryan Martin, and Sam Formholtz, a two-time Standout winner. Repeating its opening to its semifinal two weeks prior, Olmsted Falls ended the first round with a perfect score of 60 points, including the randomly-placed “plus points” question. Keystone had a slow start with only 20 points in the first round, but outscored Falls in the Current Events Round. It was 80 to 50 going into the third round, the first in which teams “buzz in,” making quickness as important as accuracy. Olmsted Falls returned to dominance increasing its lead to a score of 150 to 80. In the fourth round, several clues may be given for each answer. The first clue can yield a score of fifty points, the second forty and so forth, with the fifth and final clue yielding only ten. 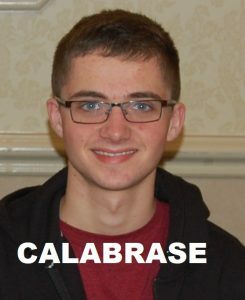 Calabrase earned his honors in this round, scoring three times, including a 50-point score when he identified Valley Forge after only one clue that mentioned Von Steuben. For Firelands, Formholtz scored 20 by identifying Carl Sandburg and Durdak 40-points when he named Madame Curie after only two clues. However, it was the Calabrase tally in that round of 110 points that assured the team’s win. The final round, which is often a runaway scoring spree for the winning team saw an equal 90 points scored by each team, but that meant Falls maintained its substantial lead. Olmsted Falls was the runner-up in last year’s Scholastic Games championship, losing to Avon High School. The school previously held the record for championship wins in consecutive years (four from 2011 to 2014) and has now tied Elyria High School for having won a total of five championships in the history of the program. The teams are guided by faculty advisors. The Olmsted Falls advisor is Ms. Erin DesForges and the Firelands advisor is Ms. Kelly Miller. The program, sponsored by the Educational Service Center of Lorain County with foundation support, has now completed its twenty-eighth season on the air. During all of those years, each participating school has been awarded tuition credits to be given to a deserving student that will attend an area college or university, each now valued at $1000. Additional such credits are awarded to schools when they compete and win in playoffs. Contributing institutions include Lorain County Community, Baldwin Wallace University, Oberlin College, Ursuline College, Ashland University, Case Western Reserve, Heidelberg, John Carroll, Notre Dame College of Ohio, and Tiffin University. Many of these have participated in the program for the entire history of the show. A member of the Broadcasters Hall of Fame of Akron and Cleveland, the program’s producer, Jim Mehrling, is a veteran northeast Ohio broadcaster. After seven years as Chief Announcer at WEOL, he was Production Manager at Cleveland’s WERE-AM for over a decade, and has for over twenty years been with Cleveland’s WCLV-FM, now a part of Ideastream public broadcasting. Again this year, most Scholastic Games programs will be followed by a talk feature, “Dialogues in Education,” which presents education success stories with its host, award-winning journalist Bob Tayek.